What Keeps You from Meaningful Relationships? Loneliness can lead to a lot of other issues; such as, depression, anxiety, low self-esteem, and even thoughts of suicide. If you’ve been feeling lonely, know it’s not God’s plan for your life. He wants us to have friends and to love each other as He loves us. 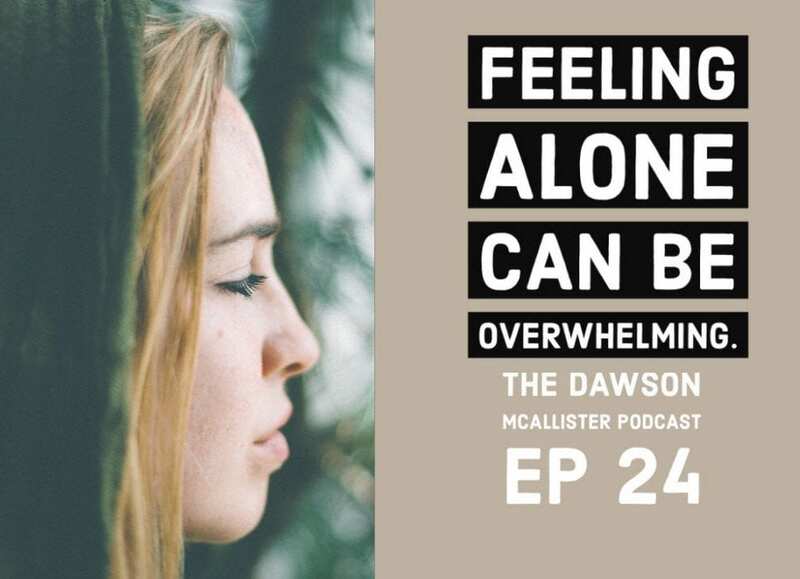 In this episode, I talk about loneliness with Amy, Tim, and Rebecca. We’ll talk about what keeps them from having meaningful relationships and how they can find and build friendships. Amy wishes she had girlfriends to go out and have fun with. When she’s not with her boyfriend, she’s at home by herself. She says, girls don’t seem to like her. Amy is asking the question, why? Why does she lack meaningful relationships, especially with other girls? It’s a challenge to maintain long-term relationships. We live hurried, busy lives and don’t always take the time to develop them. We get prideful and don’t want to appear like we need others. Sometimes we don’t know how to find and keep deeper relationships. Or it’s easy to take offense or decide we are better off without people in our lives. Many times, when we ask, why am I lonely? We already know what the answer is. The challenge is it’s too emotionally risky to solve the problem. Most people know what to do, they just don’t know how to do it or they are not willing to pay the price to remedy the problem. What are some reasons people are afraid to reach out? Pride – Amy doesn’t want to look like she’s trying too hard to make friends. Fear of rejection – you have to put yourself out there and you don’t know how the other person is going to respond. Confused about how many friends you really need. Amy is thinking about a lot of friends but one friend at this point is really all she needs. Most people only have 2 or 3 really close friends anyway. Some people don’t understand there are sacrifices to developing new relationships. Amy may have to cut back on her time with her boyfriend to take the time to make friends with other girls. It’s worth it but it’s not easy. Amy needs to put aside her pride and be willing to make the first move toward gaining a friend. She needs to begin to show herself friendly. She can’t just wait for friends to come to her. This means she has to set aside time to get to know other people. She’s going to have to get out of her comfort zone and do activities with people other than her boyfriend. Amy has the tools to do this and with God’s help she can. Tim was an only child and both of his parents died. He said they were very poor but he never lacked for food or clothes, his parents took good care of him. It’s been 5 years since they died. Tim works in the oil field and makes good money but the girls he’s dated think he’s gullible and lonely. Lonely people have often been struck with major hurts and tragedies. Sometimes through no fault of their own, the very people who would help fill the gap of aloneness are snatched from them. Grief and loneliness can come hand in hand. Tim has really been through it…losing both parents can be devastating. Ye he’s the only one who can make the changes in his life that will help develop deep, important, and potentially long-term relationships with others. Tim, however is constantly reminded he’s all alone. He’s had shallow relationships with girls who don’t care about him. At the same time, he’s observing others who are enjoying the good family life. So, what hope does Tim have? Rebecca is feeling lonely and wants more friends. She has 2 friends at school, but they are in different classes, so she doesn’t see them much. God’s going to help Rebecca. Part of His plan is found in Proverbs 18:24, “A man that has friends must show himself friendly: and there is a friend that sticks closer than a brother.” As I mentioned to Rebecca, if she is a good friend and shows others she’s approachable, then people will want to be around her. One key to making friends is shared experiences. This is why teammates can become so close as well as roommates, coworkers, and people into the same interests. They share experiences together and get to know each other while doing similar activities. Rebecca needs to find a group to join; whether it’s a club, team, community service group, study group, or youth group. This way she can get to know people through shared experiences. Meaningful relationships do not develop overnight. They take time and must be cultivated. A friend can make all the difference in your life whether you are going through a really hard time or you are doing well. A true friend, as the Bible says, can stick closer to you than a sister or brother. My prayer for you is that you will find the right kind of friends and they will help you and you will help them and you will have a much richer life. God bless you as you seek to find those friends. Check out my eBooks: Understanding Loneliness and Understanding Friendships. Check out this story of hope from Leigh who struggled with loneliness: Isolation. Need to talk about loneliness? Sign up for an Email Mentor, an online coach who will email you and come along beside you to offer support. Join me for my next episode on verbal abuse in the family. The words of an abuser can cause all kinds of agony and can set one on a lifelong destructive course. In this episode, I speak with Lance, who’s verbally attacked by his parents. I also talk with Sarah who endures verbal abuse at least twice a day trapped in the car with her dad. And the most difficult conversation I had is with Tameka, whose father emotionally and verbally abuses her. He calls her names and puts her down every day. If you need help dealing with verbal abuse in your family, then this one is for you! But what do you do if you try to be a better friend and try to be friendly, but it’s like people don’t care I always try to ask people how they are? And what is happening in their lives? But it seems like they don’t appreciate me, my personality, and who I am as a person. It seem to me like they don’t care how I feel and they never ask. It’s great you are making an effort to engage with people to be friends. Many people these days, just don’t take the time to honestly talk to people like you are doing. You will be a great friend to someone. The hard part is finding the right people to be friends, however, don’t give up on finding them. There are people out there that will reciprocate your interest in being friends. Do you have any hobby’s you’re interested in? Going to events or places that attract people with your similar interests is a great place to start. How about downloading our eBook on Understanding Friendships or Understanding Loneliness. They are full of ideas and ways to make friends and to overcome loneliness. and His Will be done….not our will be done! Praises and Glory to Him!